The Soviet bureaucracy, that is to say the most widespread and complicated bureaucracy in the world, has to deny itself almost entirely an elementary piece of organizational equipment, the duplicating machine, because this instrument potentially makes everyone a printer. … It is clear that Soviet society has to pay an immense price for the suppression of its own productive resources—clumsy procedures, misinformation, faux frais. During the period of Martial Law in Poland after 1981 when the government stamped down on Solidarity, the anti-communist alliance of intellectuals and workers, the police raided art schools to take away the screen-printing equipment. Nevertheless, samizdat production (self-publishing) continued illicitly there and throughout the Bloc. At the same time, what Tom Kovacs called the ‘spirit of metaphor’ shaped dissenting culture in the Eastern Bloc. When, for instance, the famous Solidarity logo was banned, the Poles invented new symbols which did not draw the rancour of the state. Ordinary people would wear electronic resistors in the ‘national’ colours of red and white. Everyone knew what this gesture meant but for the state and its henchmen to act against those wearing these tiny pins would have revealed the absurdity of the situation. ‘Aesopian’ parables and allegories found their way into many different kinds of posters. 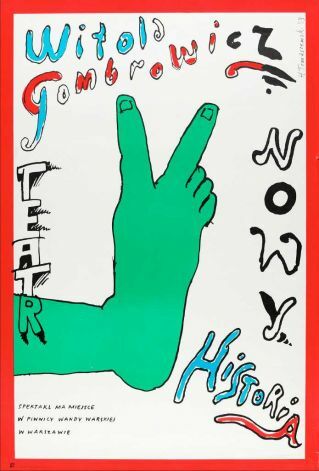 In a 1983 theatre poster for a performance of a work by Gombrowicz, Henryk Tomaszewski sketched the image of a foot apparently making the ‘V’ gesture with its toes, a symbol which Solidarity leaders had adopted during the heady days of its rise. This was read as an allusion to the irrepressible spirit of the Trade Union then under prohibition.